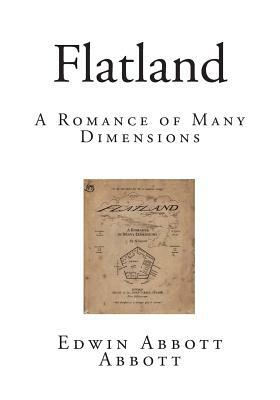 Flatland - A Romance of Many Dimensions. Edwin Abbott Abbott. Flatland: A Romance of Many Dimensions is an 1884 satirical novella by the English schoolmaster Edwin Abbott Abbott. Writing pseudonymously as "A Square," the book used the fictional two-dimensional world of Flatland to comment on the hierarchy of Victorian culture, but the novella's more enduring contribution is its examination of dimensions. The story describes a two-dimensional world occupied by geometric figures, whereof women are simple line-segments, while men are polygons with various numbers of sides. The narrator is a square, a member of the caste of gentlemen and professionals, who guides the readers through some of the implications of life in two dimensions. The Square dreams about a visit to a one-dimensional world (Lineland) inhabited by "lustrous points," and attempts to convince the realm's monarch of a second dimension; but is unable to do so. He is himself visited by a three-dimensional sphere, which he cannot comprehend until he sees Spaceland (a tridimensional world) for himself. This Sphere visits Flatland at the turn of each millennium to introduce a new apostle to the idea of a third dimension in the hopes of eventually educating the population of Flatland. From the safety of Spaceland, they are able to observe the leaders of Flatland secretly acknowledging the existence of the sphere and prescribing the silencing of anyone found preaching the truth of Spaceland and the third dimension. After this proclamation is made, many witnesses are massacred or imprisoned (according to caste).